People working at local health agencies who are looking to protect and support undocumented residents and their families. 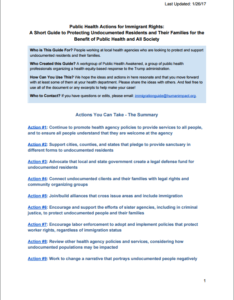 A workgroup of Public Health Awakened, a group of public health professionals organizing a health equity-based response to the Trump administration. We hope the ideas and actions in here reson ​ ate and that you move forward with at least some of them at your health department. Please share the ideas with others. And feel free to use all of the document or any excerpts to help make your case! If you have questions or edits, please email: immigrationguide@humanimpact.org.